Charles Ross is a Canadian performer who started doing geeky one-man shows in 2001 with the release of One Man Star Wars, a show so popular it went on the road all over North America. Ross’s unique style of storytelling was so renowned it earned him a spot on the stage at Lucasfilm’s official Star Wars convention, Celebration III. Star Wars was followed by One Man Lord of the Rings and now, Ross has a new one-man show about a little boy named Bruce. DISCLAIMER: I was provided complimentary tickets to One Man Dark Knight courtesy of The Pittsburgh Cultural Trust. Opinions are my own. From the madmen behind One Man Star Wars and One Man Lord of the Rings comes an irreverent parody and homage to the Dark Knight Trilogy. Two-faced super-nerd, Charles Ross, lovingly tears Christopher Nolan’s masterpiece a new one in his new One Man Dark Knight: A Batman Parody. 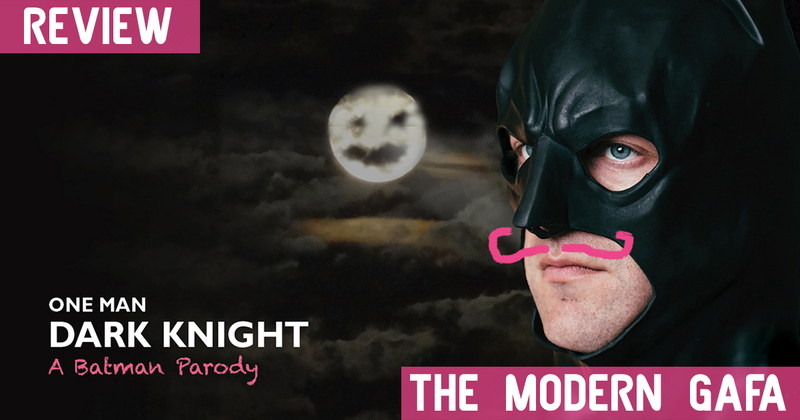 No costumes, no sets, no Batmobiles, Ross takes you on a one-hour comedic joyride, from Batman’s origins to his epic battles against Gotham’s super-villains. I’ve actually never seen a one-man show, just how they're often depicted in sitcoms. So when I heard a show based on Batman was coming to town, I pictured that episode of Friends where Chandler gets stuck in a show where Alex Borstein talks about her first period. I pictured a man in a Batman suit going on long soliloquies about cleaning up the streets of Gotham. One Man Dark Knight isn’t that kind of one-man show. Charles Ross takes the stage in a dark jumpsuit, which I figured he would remove and reveal the iconic suit and cape underneath after a version of the origin story or something like that. However, the performer doesn’t have any costume changes, but he does play over a dozen different characters over the course of his three-act performance. And while there is music, he even does explosion and collision sound effects with his mouth! Instead of mixing mythologies to tell a new story, One Man Dark Knight is a full parody of Christopher Nolan’s Dark Knight Trilogy (there are splashes of Burton and Affleck in there too) where Ross portrays every character in an abridged version of the three movie series. Not only does he do wonderful impressions of Christian Bale, Heath Ledger, Tom Hardy, and others, Ross also throws himself all over the stage in every fight scene or explosion. Yeah, I never thought I’d say “He does his own stunts” in a one-man show. Ross is a bonafide geek. As the writer of the show, he imbued the parody with plenty of jokes about the casting change of Rachel Dawes, Morgan Freeman’s early days as the exposition man, and how bizarre it is that Batman trains for years in multiple forms of martial arts and weaponry only to spend three movies awkwardly punching people in the torso. He knows the movies in and out and knows just the right bits to poke fun at. In between each act, and after the finale, Ross breaks character(s) and chats with the audience before moving on with the show. In this time he tells stories about writing the show, plugs his other shows, and does one of my favorite things: referencing local history and culture related to the city the performance is it. He’d apparently driven eight hours across the bleak Keystone State and arrived less than two hours before the show. He talked about the dead deer along the highway and acknowledged the fact that The Dark Knight Rises was shot in Pittsburgh. One Man Dark Knight was a great show, and if you’ve never seen a one-man show this isn’t a bad first one. It’s funny and at no point are you pulled out of the illusion to realize it’s just a man dressed in black slamming on the stage floor and having emotional conversations and action-packed fight scenes with himself. The show was a perfect reminder that even a superhero known for being serious can always make you laugh.